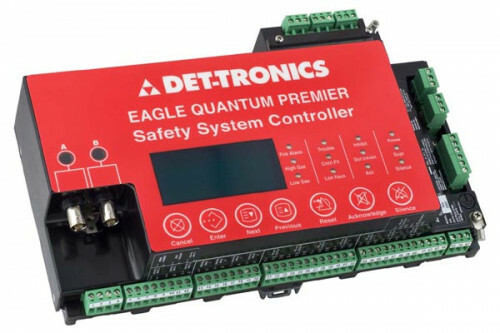 The Eagle Quantum Premier® Controller is a microprocessor based module that performs all the communication and control functions for the fire and gas system. The controller is approved as an annunciation and releasing device for fire alarm systems. The Local Operating Network/Signaling Line Circuit (LON/SLC), through which all field devices communicate, starts and ends its loop at the Controller. The Controller continuously monitors the field devices on the LON/SLC and performs the logic functions needed to generate the appropriate output(s). The Controller performs both static and user programmable logic operations. Static logic activates built-in annunciation circuits, consisting of both visible and audible alarms, per ANSI NFPA 72. Programmable logic allows the Controller to be customized to perform a variety of complex logic operations. Using Det-Tronics Safety System Software (S3), the Controller can be programmed to implement any cross-zone monitoring, voting, or timed operations that might be needed in a fire suppression system.